When I read Jan Köhnlein’s post about multitouch gestures support in their graph viewer, I was thinking, these gestures would be a nice addition to the Zest visualization library. In addition to that, it could be my first new feature as a Zest committer, so I opened bug 371152. So I looked into the multitouch API in SWT (btw. it is really to use, check snippet 353). Luckily, only a gesture listener had to be added, that is already supported by the Zest graph widget. I thought about what gestures could be universally supported in the Zest graph, and found that scrolling is already supported, magnification is easy to implement, and for rotation I found a possible use. I believe the base implementation of the gesture support is useful, but I am open to change it if someone has a better idea. If you’re developing with EMF it is a common task to separate the model into multiple files along with enabling the user to create crosslinks between them. This works out-of box if the files are located inside the same project. However, in some cases for larger models it is simply not enough. It can be useful to be able to define reusable (and versioned) packets of models and enable the user to define a configuration which determines the imported model packages. Sounds familiar? The same functionality exists in PDE. Maybe it can be reused for non-java purposes. 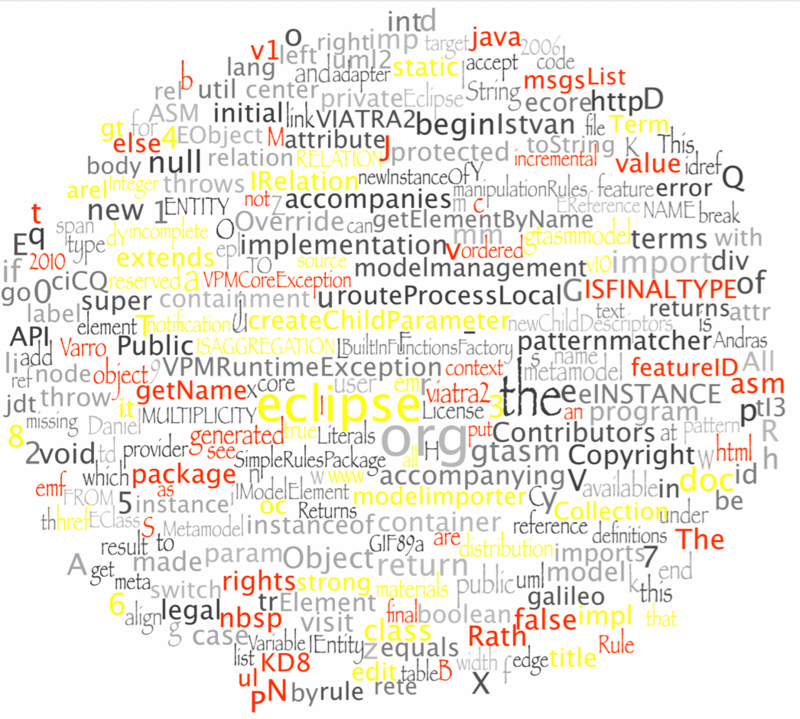 The research of my group often build on various Eclipse technologies. We are developers of the VIATRA2 model transformation framework. Recently we also created EMF-IncQuery, an incremental query technology over EMF models, that we believe really useful in various areas, such as model validation during editing or model synchronization scenarios. High-performance model queries are still a major challenge for the industry standard Eclipse Modeling Framework (EMF), as they are intensively used in various model validation, model transformation or code generation scenarios. Existing EMF-based query technologies (like OCL, EMF Query or native Java programs) have significant scalability issues for models over 50000 model elements. Moreover, it is often tedious and time consuming to efficiently implement EMF-based queries manually on a case-by-case basis. This talk introduces EMF-IncQuery, a declarative and scalable EMF model query framework. EMF-IncQuery uses a graph query language, and provides incremental query evaluation by caching the results of the model queries and incrementally maintaining the cache when the underlying EMF model changes. Furthermore, the EMF-IncQuery framework can be easily integrated into existing EMF-based applications in a non-intrusive way. During the talk, we quickly overview how easy it is to define and integrate highly scalable model queries into existing EMF-based applications, in the form of a very short live demonstration using the MDT Papyrus modeling tool. The scalability of the engine will also be demonstrated, with on-the-fly constraint revalidation that takes less than 100 milliseconds over large AUTOSAR models with over 1 million elements. Unfortunately, I cannot go to the conference, but I hope, the 10th birthday of Eclipse will be celebrated well. Have fun, and if you are interested, listen at our talk. Today I read the announcement of SourceCloud, a new Zest/Cloudio-based visualization for source code. As I like cool visualizations, I tried it out on the open projects I am participating in.At first I created the cloud for the source code of the Debug Visualisation project. 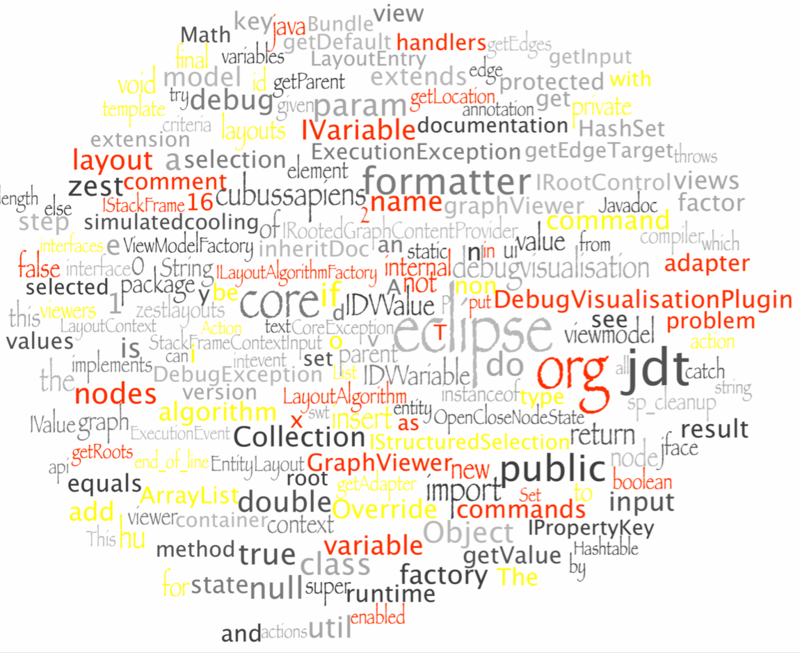 Globally it consists of about half Eclipse debugger/UI and Java keywords – as this is quite a small project (about 4 kLOC), this is somewhat expected with 200 words. The cloud of the VIATRA2 model transformation framework is more interesting: it is a much larger codebase, developed for several year by around a dozen people. 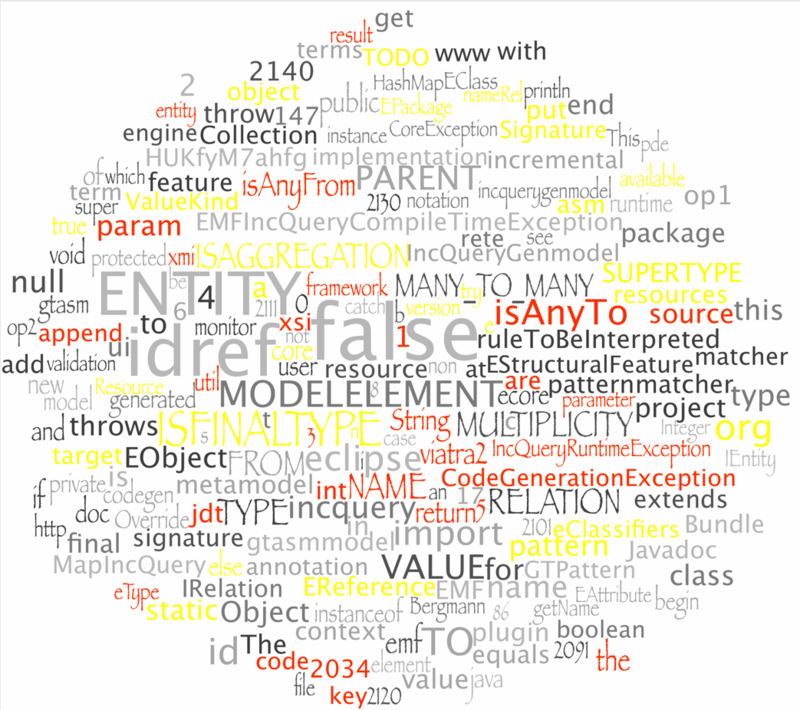 Because of the size I generated the cloud using 300 words, but almost no Java keywords found their way into the graph. However, the mandatory comment parts did, e.g. nbsp or the names of some creators. A lot of EMF-specific keywords are also present. They are present because we have quite a large EMF metamodel that provides several hundred generated Java files. At last, but not least I also checked the cloud of the EMF-IncQuery project. This is smaller, then the VIATRA2 project, but larger then the Debug Visualisation. Additionally, it has a shorter history, but with several key committers. My personal favorite is this diagram, as it shows a lot of nice things: e.g. four digit numbers in large quantities (magic numbers FTW) or the absolute champion string: ‘HUKfyM7ahfg‘. All of them are present in the Ecore Diagram of the defined metamodel (the meaningless string 152 times as a postfix of an identifier 🙂 ). At least, I learned something about the internal model representation of GMF. And how do your projects look like? Last week we created in the university a nice demo application to demonstrate the validation capabilities of our EMF-IncQuery framework. The application was presented on the conference ECMFA 2011 as a tutorial. EMF-IncQuery provides an incrementally evaluated model query framework: as the underlying EMF model is changed, the query results are re-evaluated, and are instantly returned when needed. Queries are formulated using the pattern language of the VIATRA2 transformation system, and the Java code necessary to execute queries are generated. In our demo application we extended the Papyrus UML editor with on-the-fly validation of well-formedness constraints. During editing we check for non-local constraints (e.g. a Behaviour must have the same number of parameters as the corresponding operation); display the results in the editor and in the problems view; we try to provide and remove these error markers without saving or manual need to start validation. Basically, the constraint validators are generated from specially annotated VIATRA2 patterns; the generation is currently somewhat specific to the Papyrus editor, but can be extended to support most EMF-based editors easily. A screencast of the demo is presented below. It is important to note, that the Papyrus editor was not modified in any way, and the framework generated all Java code used during validation. More details about the demo application, such as source code, tutorial slides, can be found on the homepage of the application.